It was just another Saturday in a busy suburban mall. Marco pulled into the parking garage for his mall job at Grill ’n’ Shake, when suddenly a car tried to run him over. Marco then realized it was Mike Richter. Marco had accidently made a tiny scratch on Mike’s car a few days back and now Mike was after him, so Marco hid next to the HVAC machines nearby hoping that Mike and his gang would not find him. But Marco was not ready for what was about to happen next. When Mike’s gang could not find Marco, Marco stepped out from his hiding place. But he noticed something strange; there were footsteps in the dust and he was certain Mike and his gang didn’t go that way. He followed the footsteps and noticed a black box that was beeping. 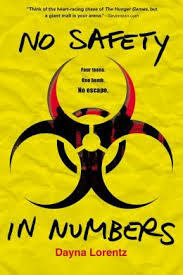 No Safety in Numbers by Dayna Lorentz hooked me in from the beginning to the end. I could not put the book down until I was done reading it. Everyone in the mall at the time the bomb went off was quarantined inside because the Senator ordered it. However, the Senator made the wrong decision. “How was I supposed to know that regulations required evacuation, not quarantine?” The Senator said. The mall started giving out free food and gift cards to everyone inside for any inconvenience the situation may have caused. Nobody inside knew what was happening and as each day goes by, it becomes harder to ignore the dwindling supplies, inadequate information, and mounting panic. At first, there’s the novelty of being stuck in a mega mall with free food and a gift certificate. But then people start getting sick. Riots break out. People demand to be let out. Lorentz’s No Safety in Numbers mesmerized me with its interesting plot and creative characters. It had me flipping from page to page, drawn into the suspense and action. No Safety in Numbers is narrated by two boys and two girls. They are Marco, Ryan, Shay, and Lexi. Lexi is the Senator’s daughter she likes working with computers. She is always in trouble trying to acquire knowledge on the situation. Shay is a caring person who always has her nose in a book. Ryan is a jock and hangs out with his brother’s friends in hopes that he will become popular. Marco has a job at Grill’n’Shake, a restaurant in the mall, and tries to stay away from trouble when he can. Throughout the story, these ordinary teens come together to survive an extreme situation. The mall has 150 stores and when the bomb went off, many stores ran out of supplies on the first day. The story takes place over a seven day period, most of that being inside the mall. What type of bomb was it? What if it was extremely deadly? Why was everyone quarantined if the government knew there was a bomb? All these questions are answered as these four regular teens are faced with impossible challenges. No Safety in Numbers is a harrowing look at what can happen under the most desperate of circumstances. It is perfect book for anyone who has felt ordinary, plain, or not gifted. I read this book because I like dystopian, action, post-apocalypse, and survival books, and this was one of them. I would recommend this book for ages 12 or older or anyone who likes The Maze Runner or The Hunger Games. This book is definitely one of my favorite books and it is a book you should definitely read.